Do you ever long for days full of joy and energy--days that bring out the best version of you rather than leave you exhausted? Do you sometimes catch yourself wishing life was more impactful and fulfilling? In a world that's moving so fast, it's easy to lose your sense of purpose. So now is the time to make each moment of your ordinary, everyday, beautiful existence count. 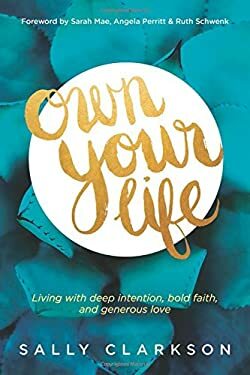 It's time to own your life.Sally Clarkson's "Own Your Life" is a breath of fresh air into the life and soul of a busy woman. Like a faithful friend, Sally journeys with you to explore what it means to live meaningfully, follow God truly, and bring much-needed order to your chaos. Each page offers deeply personal, authentic, and practical guidance to help you build an intentional life. Discover what it means to own your life, and dare to trust God's hands as He richly shapes your character, family, work, and soul. New (31 available) BRAND NEW. Over 1.5 million happy customers. 100% money-back guarantee. Make your purchase count: support Better World Books' worldwide literacy partners.